For a long time, Caterpillar Inc. (NYSE:CAT) was synonymous with stability, growth and durability. 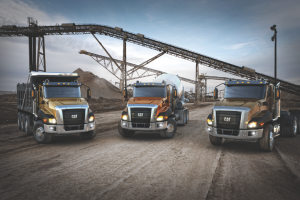 One of the hallmarks of American heavy industry, the company has been around for decades, and most of the time, it has managed to perform admirably. However, the numbers the company has been putting out recently are far from encouraging. After a sizable miss in the last quarter of 2012, the company has again failed to meet analyst expectations. What’s going on? While not as dramatic a miss percentage-wise as Q4 2012, Caterpillar Inc. (NYSE:CAT)’s latest results were pretty dismal. The company reported EPS of $1.31 versus a consensus of $1.40. This doesn’t sound too bad, since it’s “only” a $0.09-per-share miss. However, this figure is down more than a dollar compared to the same period a year ago, when the company reported $2.37. Revenue for the quarter paints a similar picture. The company reported sales of $13.21 billion, down from nearly $16 billion a year ago and missing the consensus by around half a billion dollars. On the back of these figures, the company drastically lowered its guidance for full-year 2013, now expecting sales of $57 billion-$61 billion versus its earlier estimate of $60 billion-$68 billion. EPS is expected to come in at $7.00 per share, the low end of the previously given range. According to the company’s management, much of the sales weakness for the period was due to changes in dealerships’ new equipment inventory. As dealers were anticipating an increase in demand during the first quarter of last year, they spent some $875 million on expanding their inventories. Now, as demand seems to be declining again, they have reduced their inventories by around $700 million. In a word, the problems center on mining, or the company’s Resource Industries segment. Demand for mining machinery has been severely depressed throughout the quarter, as miners have substantially scaled back their capital expenditures. The revised outlook now expects a 50% decline in Caterpillar Inc. (NYSE:CAT) mining machinery worldwide, which accounts for the bulk of the downside revision. As a result, the company is putting a lot of effort into realigning its production and capital expenditures with shifting demand. Market conditions have been particularly tough on miners recently, with BHP Billiton Limited (ADR) (NYSE:BHP) undertaking a number of measures to cut costs in the face of macro-economic uncertainty. As metal prices have dropped, so have corporate profits and share prices as a result. BHP’s new CEO has taken a pay cut, remarking that his focus remained on slashing costs and improving operations. Vale SA (ADR) (NYSE:VALE), another global mining giant, has also been under severe pressure. Annual EPS was almost halved in 2012 as the company struggled with volatile metal prices and its tax battle with the Brazilian government. Despite the broader market rally, most major miners are down for the year, Vale SA (ADR) (NYSE:VALE) dropping some 24% and BHP Billiton Limited (ADR) (NYSE:BHP) down over 18%.